The latest VIP package offered for Tech N9ne’s “Hostile Takeover 2012” Tour is jam packed with limited and exclusive offers like this brand new Strange Music flag. This exclusive Strange Music flag measures 3’x5′ and features an over sized Strange Music logo in red, great for any fan looking to represent their favorite indie label. With extra room for signatures, this flag is the perfect item to bring to a one hour meet and greet with the artists. The only way to get your hands on this and many other great items is by purchasing your very own VIP package to Tech N9ne’s “Hostile Takeover 2012” Tour featuring Machine Gun Kelly and Strange Music’s Krizz Kaliko, ¡MAYDAY!, Prozak, and Stevie Stone! 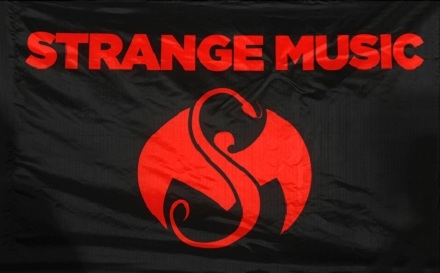 Do you like the new Strange Music flag? Will you be purchasing a VIP package?